Crystal Palace Park is situated in the northwestern corner of Bromley, abutting the boroughs of Croydon, Lambeth, Southwark and Lewisham. 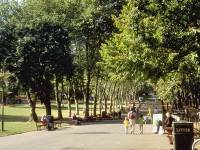 The park, situated high on Sydenham Hill, has three claims to fame. Within its grounds is one of Britain's most famous sports venues, the Crystal Palace Athletics Stadium, where many a national and international track & field competition has been staged. A second, and greater claim to fame - sadly, a historical one - was the situation here of the structure that gave the park its name. The Crystal Palace, a massive and imposing edifice of glass and iron by Joseph Paxton, was originally erected in Hyde Park for the Great Exhibition of 1851. It was said to be 1848 feet long by 408 feet wide, and 108 feet high within its centre atrium. 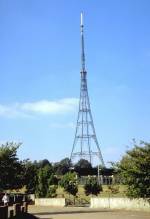 Following the closure of the exhibition the Crystal Palace was dismantled and re-erected on this green space in south-east London. Tragically, it was destroyed by fire in 1936. The saddest aspect of its loss is that there never seems to have been any move to recreate it - it would still be one of the wonders of the capital. 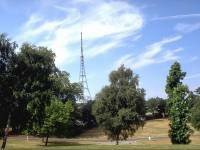 In more recent times, the park's situation at one of the highest elevations close to cenral London made it the natural site for the BBC to build London's main broadcast tower. 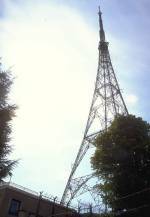 Dating from the early 1950's, the Crystal Palace transmitter remains unique in being the only self-supporting lattice tower of this scale in the country (nearly all the rest are guyed masts). 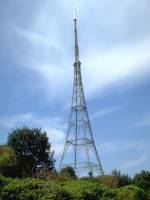 It is the tallest structure in London, with a height approaching 900ft. The white tubular structure at the top is a protective casing enclosing the transmitter's radiating aerials for UHF television services. 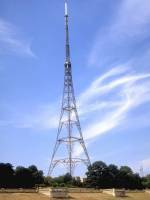 The station serves more than 20% of Britain's population and packs a punch of a thousand kilowatts per channel. The original VHF television service from this same mast had a normal reach of over 50 miles, and there is a documented report of a freak reception of its signal in Perth - western Australia!